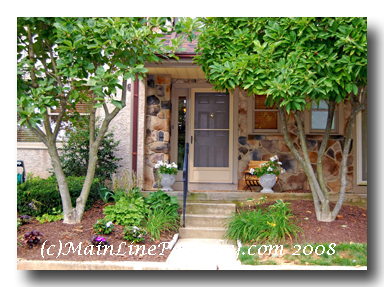 The entrance foyer features refinished hardwood floors, and a first floor powder room. There is a partially finished lower level with a Custom Wood Bar and second fireplace, offers some alternative area to relax with room for entertaining and a big screen TV and a Utility Storage Area. The second level has a Master Bedroom Suite with Master Bath,Vanity Sink and 2 additonal Bedrooms with ample windows and some customized closet storage. There is a Family Bath with shower/tub combo. The Fourth Bedroom Loft has skylights and track lighting. Oh, did I mention that the Refrigerator, Washer, Dryer, Window Treatments AND the Custom Wood Bar are ALL included in this new “best buy”? The Community of Chesterbrook in Wayne, Pa 19087 is a sought after community of town homes, carriage style homes, condos and single family homes located within the highly rated Tredyffrin Easttown Township School District within Chester County Pa. Chesterbrook readily meets the needs of First Time Home Buyers and Downsizing Buyers. The convenience of being within minutes of the Paoli Train Station (Amtrak to New York City) and the Devon and Berwyn Train Stations offers commuters easy access to the City of Philadelphia in approximately 35 minutes via the Paoli Express. Chesterbrook enjoys the convenience of The Chesterbrook Shopping Center with a Genuardi’s Supermarket, Manhatten Bagel Shop, Pizza Shop, Rita’s Water Ice and Drugstore for your daily shopping needs. The Gateway Shopping Center is less than 5 minutes drive and the major King of Prussia Mall and Exton Malls are a short ride away. Contact Judy Peterson with Prudential Fox & Roach Realtors, Devon Home Marketing Center, Direct, 610-889-5509 or Office 610-651-2700 for additonal information on this property and the community of Chesterbrook. It will be our pleasure to help with all your Real Estate questions. 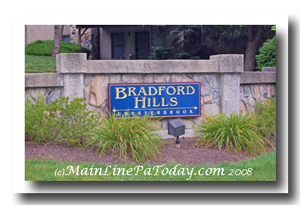 This entry was posted on Monday, August 11th, 2008 at 4:36 am	and is filed under Chester County, Chesterbrook, Featured Listings, Lifestyle. You can follow any responses to this entry through the RSS 2.0 feed. You can leave a response, or trackback from your own site.